When to Prune: Typically, rhododendrons and azaleas are pruned after they bloom. This preserves the current seasons bloom, and allows time for the plant to produce flower buds for next years bloom. Rhododendrons and azaleas set next year's flower buds by mid to late summer. Pruning branches after buds are set removes next year's flowers. Rhododendrons and azaleas send out new growth after they bloom or after a branch is pruned. Late summer or fall pruning is not advisable as new growth may not be hardened off prior to first frost and may be subject to damage. Some rhododendrons that bloom very heavily can be pruned prior to bloom to reduce the number of flowers and thus maintain plant vigor. Clean-Up Pruning: Removal of dead, diseased or damaged branches can be done at any time. Tools to use depend on the size of the branch, small branches can be removed with a pruning shear, larger branches require a lopper or pruning saw. Broken branches should be cut just above a dormant bud. Dead branches should be cut back to a branch point, where dormant buds can send out new growth. Interior branches that do not get any light may be removed, because they will eventually die. Diseased branches should be pruned well below any diseased area and disposed of in the trash bin. Shape Pruning: Pruning for shape enhances the rhododendrons form and habit. All rhododendrons can be pruned to maintain their natural habit, but to try to keep a tall growing rhododendron small or low growing is not practical. Tall, leggy plants should be replaced with smaller varieties or plants having a low, mounding growth habit. If a plant grows out over a walk or needs to be restricted for some reason, it may be pruned back moderately without fear that the plant as a whole will be damaged. Remove weak or crossing branches. This provides improved air circulation and removes branches susceptible to disease and insect damage. 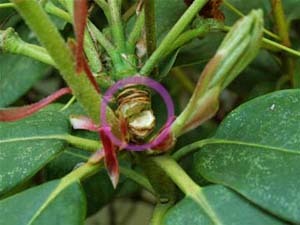 Rhododendrons should be pruned just above a growth bud. Don't leave short branch stubs which will die and can become an entry point for disease. Evergreen azaleas can be sheared for hedges or borders. Unlike rhododendrons, evergreen azaleas can be sheared each year after flowering to create a densely-shaped plant. Deciduous azaleas can be cut anywhere on the stem and they will branch from that point, though they should not be sheared as severely as evergreen azaleas. Pinching or shearing the new growth can induce branching. Timing is important if optimum results are to be achieved. If new shoots are pinched too early the likely result will be a single new branch replacing the nipped growing point. If pinching is done at the right time several buds will break below the point pruned. Early summer is usually a good time for shaping azaleas. Rejuvenation Pruning: As rhododendrons age they lose leaves and often become open and very leggy. Rejuvenation pruning, can be useful to reshape a plant. By pruning just above viable dormant buds, new healthy growth can be directed to obtain a more desirable shape. The larger-leafed rhododendrons have many dormant buds that can be forced into new growth. However, on very old wood, the dormant buds may have atrophied and are not viable. So there is some risk that drastic pruning may not be successful. A safe procedure is cut out about one-third of the old wood spread over a period of three years. In this way, there remains sufficient leaves to supply nutrients to keep the plant growing successfully each year. Spent Flower Removal (Deadheading): It is desirable, with the large flowered rhododendrons, to remove the withered flower clusters after the blooming season. This is fairly easily done as the central axis of the cluster, usually called a truss, will break free from the plant with a push of the thumb pushing on the side, or can be cut off with a hand pruner. (See photo.) Dead-heading is usually done to make the bush look more attractive, to reduce the prevalence of fungus and to prevent a heavy set of seed. If it is not possible to remove the old flowers, it is usually not too detrimental, but flowering the next year may be reduced. When deadheading care should be taken to not damage the growth buds or new shoots which are located just below the flower cluster.